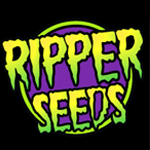 Ripper Seeds - DO-G. Free US delivery. DO-G looks like a very unusual name until its parent strains are revealed as White Fire OG (otherwise known as WiFi #43) and a reversed Do-Si-Dos. Here is a blend of Cookies and OG that really maximises both the flavours and the potency of both parents. DO-G is a 50/50 hybrid strain to be grown either indoors or outdoors where the climate and weather will allow for a mid-October, northern hemisphere harvest. Indoors it is recommended to veg. the plants for a period of between two to four weeks before the switch to flowering during which plants will double in height. This latter stage will continue for between 60 - 65 days, thereafter large yields of buds will be ready for drying and curing.